Hard to believe that it's been a year since I stumbled across Little Brown's Surprise announcement at NYCC 2015 for a sequel to Under the Sparkling Sea. It seems like only yesterday that I was in New York City for New York Comic Con, when in reality I'm going to be there again in two days for the 2016 con. Amazing how time flies. 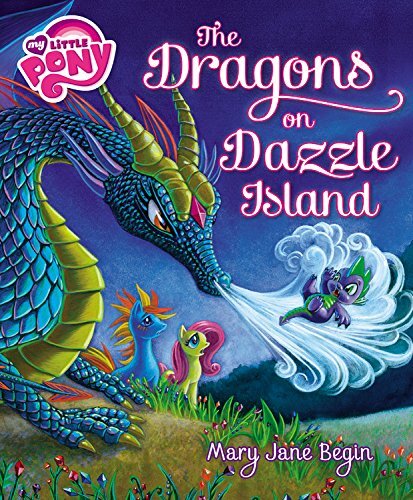 And time waits for no man, or pony and as the release date for The Dragons on Dazzle Island marches into the past this major MLP book release must eventually go with it. But no major book release is complete without an interview of the creative behind it. And I had the distinct pleasure to interview The Dragons on Dazzle Island Author and Illustrator Mary Jane (MJ) Begin. 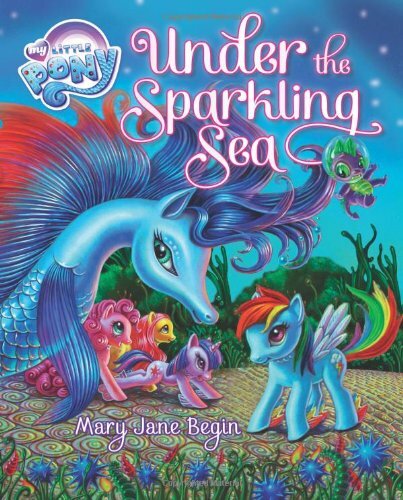 After the break you'll find insight into MJ's creative process, what her thoughts were working on My Little Pony: The Art of Equestria, why you should call upon the seaponies when you're in distress, and the unused original title for The Dragon on Dazzle Island! If you're interested, check it out blow! The Illustrious Q: MJ, I just want to say thank you so much for agreeing to this interview. Mary Jane Begin: You're very welcome! TIQ: How'd you first become aware of My Little Pony: Friendship is Magic? Did a friend recommend it to you, a family member, got curious form the MLP related means on the internet? MJB: Actually, no. I knew about My Little Pony Gen 1 as it's been around a long time, since the 80s, but I became aware of the pony world really through a friend who's the Senior Art Director at Hasbro. His name is Ed Lane, and I went to college with him. He graduated a year after me. Well, he came to me in, I'd say maybe, 2007 or 8 and said, "We have this idea about making a picture book out of one of our intellectual properties. Would you be interested?" I was like, "Sure. I'll come in for a meeting." They had two ideas at the time: My Little Pony and Candy Land. They said, "Which would you be more interested in?" I said, "Well, My Little Pony has characters, and it's ponies." That interested me more for a lot of reasons. The drawings, the characters. We talked about it. I did some sketches. I wrote a story and then it went quiet for a year and a half. I didn't hear anything more. I figured that the project was dead and as an illustrator that happens sometimes. I didn't think much of it. 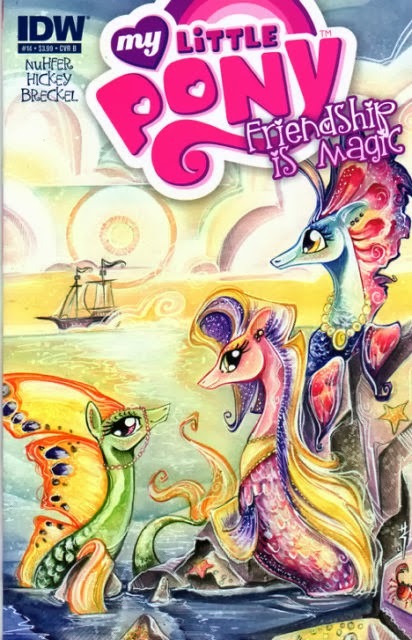 Roughly a year and half or so later, they contacted me again and said that they were working on a show which was My Little Pony: Friendship is Magic and that they wanted to have a trade book that could come out at the same time and would I be interested? I said, "Yeah, of course." I started working on just ideas for stories and talking about it. At the point that I finally signed the contract they had scripts for Friendship is Magic and they had one little short intro video. Just a little short animation and I saw a style guide. Mostly I was relying on the scripts and toys that they gave me to work off for the first book, Under the Sparkling Sea. At that point I became immersed in this story line. I read every single script for season 1 and really started to understand the characters. What are they all about? I have to know them to illustrate them and to write a story about them. Fast forward, I did the first book, Under the Sparkling Sea. It came out right around the time, I think during season 1. Then I was commissioned to do the second book, The Dragons on Dazzle Island. By then I had written The Art of Equestria so I had researched My Little Pony heavily. I watched every episode from season 1 to season 4 so I really know those characters. I love them! That's how I became immersed in the world. By the time I did the second book, The Dragons on Dazzle Island, I knew them well and that's why the story, I think, is even more closely related to the show. TIQ: Having all that experience, who is your favorite pony? MJB: That's so hard a question to answer. Can I have two? MJB: We always are reflecting ourselves in our choices, right? Whatever we like it's sort of a reflection of who we are. The two characters that resonate most with me are Twilight Sparkle or Princess Twilight Sparkle because she's a brainiac. She's a thinker. I love that about her. And Fluttershy because she has great affinity for creatures and a gentle nature. I love them all, but those two are the ones that speak to me most. TIQ: Let's see. My two favorites are Rainbow Dash and Discord. MJB: Discord is a great character and I love that he is a reflection of Q from Star Trek: The Next Generation. I'm a Trekkie. I love Star Trek. I've watched every episode of every season. Old, new, all of it. My daughter is named Gates after Gates McFadden. I grew up watching Star Trek: The Next Generation, Star Trek: Deep Space Nine, Star Trek: Voyager, and Star Trek: Enterprise. I cried when Enterprise was cancelled. That was the end of an 18-year run on television, which is incredible to think about it. MJB: It's true. Yeah, my kids were introduced to Star Trek before the new films came out. So they would talk about Star Trek with their friends and their friends had no clue. "Who is Spock? What are you talking about?" Then the new movies came out and of course that generation learned pretty quickly. My kids are 20 and 22, so when they were growing up it was during the window that Star Trek didn't appear on television. Yeah, a huge Trek fan. What can I say? Q is one of my favorite characters from The Next Generation. So good! TIQ: I cosplayed as Q at San Diego Comic-Con this year for the premiere of Star Trek Beyond. It was a dazzling experience. TIQ: And speaking of Dazzling, what was the inspiration for the story surrounding The Dragons on Dazzle Island? MJB: The first conversation about that story started with my editor. Well, I call her my editor but she's Senior Manager of Hasbro Global Licensing, Marissa Mansolillo. We just had lunch one day and started talking about what the next book could be. I started thinking about the dragons from the style book. I had seen the show and while there were dragons they were underplayed or not portrayed in a positive way. I wanted to do something with the dragons. I knew that for sure. We wanted the ponies to travel to a new place that wasn't in the show but could be. It was important to have it make sense in the world but it wasn't part of something that somebody else had written. I started thinking of an island. We have dragons. So it was just a matter of talking through what could happen. As we talked through lunch, I have no idea why dragon eggs popped into my head, but that started to make sense. Maybe the dragons could be laying their eggs on the island and it has something to do with the ponies. That was the kernel of the story's beginning. When I draw I start with a scribble. When I write I start with just a loose sort of sketch in my mind of what the basic theme is here. What do we need to talk about? Who are characters? From there I just storyboarded it out. I then wrote a much longer text that had to go back and forth between Hasbro for editing because it's a picture book. Storyboard with the original title of The Dragons of Dazzle Valley. That's the way it is for picture books. I had to watch my word count. We went back and forth a bunch of times changing and tweaking part of the book. I had to edit out certain parts, bring in a few new things all while making sure that I was true to what had already happened in the show while paying attention to the season where it would land when it was published. Now that the show is so well established, that was an additional thing I had to consider as I was writing the story. But I've always wanted to draw a dragon. That might have been part of it. TIQ: Well, the dragons were really well detailed and beautiful to look at throughout the books. For some reason the designs contrasted with the design aesthetic Spike established in the show. Was that a decision from Hasbro or was that something that you realized as you were working on the book? MJB: That was my decision. Dragons are invented, but they come from a source. The source is reptiles. I looked at a lot of other people's dragons, and I looked at a lot of reptiles and said, “What should these feel like? These are mother dragons. 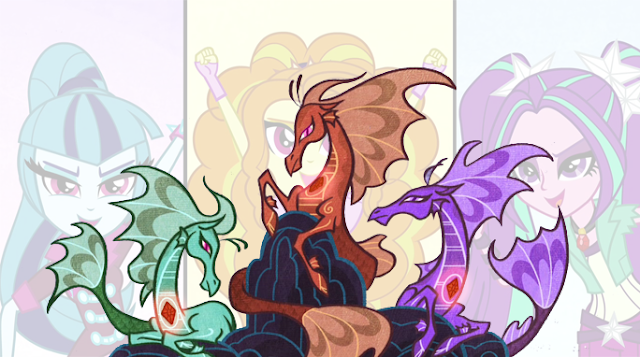 We had never seen a female dragon in the realm of pony at that point. What could it look like?” It doesn't have to look like Spike. Spike could be a whole other species of dragons. They probably all don't look alike. It occurred to me that we could stretch the design a bit for how they would work in this story. Hasbro didn't want me to sacrifice my style in doing this. It's almost like heightened fan art. Like I'm working in my own way to interpret this realm and they encouraged that. The fans, so far, have been really supportive of that notion. That was the reason why I was worried about them looking just like Spike or even like the other dragons in the show, which are really much more cartoon like. Their angles are much stronger but they're also male. They're all male dragons to my knowledge. In the show, I can’t recall if we’ve had a female dragon. TIQ: You'll have to sit down and watch the Season 6 episode that introduced a princess dragon. MJB: Oh Yeah! A female dragon and she looked different from the other dragons too. So I guess it's like character design. There's a stretch between one and the other which I think is cool. TIQ: Yeah. If anything the dragons are the characters with the most diverse character designs in the entire show because no two dragons, so far, have looked alike. MJB: That's right. The ponies have a certain way they need to be drawm proportionally. Even within that, there's variation depending on how funny the show writers want the character to be. We look at The Art of Equestria and it's filled with all the different pony designs but there's the main core style of pony too. I was really careful about that on this book because I wanted it to be as close as possible to the translation of the ponies in the show but in my style. My daughter—Gates, who is named after Gates McFadden—works at LAIKA on their stop motion animation armatures. She made an armature coated in a silicon cast in exact proportions of the ponies. She made this for me so that when I drew the characters they would be as proportioned as possible. 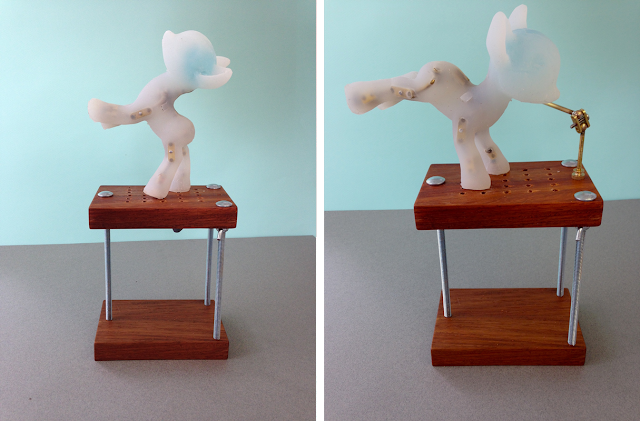 The toys are stiff and don't move—and have a lot of hair that gets in the way of the structure of the body—but this helped me to keep the pony model really consistent from all angles. MJB: She did a great job. Hand cast it. Yeah, she's very talented. TIQ: Oh, did your daughter end up working on Kubo? MJB: So yeah, it's neat. But that really helped a lot for the consistency of the pony character. TIQ: And speaking of being consistent with the designs here, I noticed that there was a drastic shift from Under the Sparkling Sea to The Dragons on Dazzle Island with the style of how you painted the ponies. Was that something that came up from when you wrote The Art of Equestria or was that something that you just decided to take upon yourself to really get into with this book? MJB: For the first book, I had only the toys to look at and some style guides. So there wasn’t a vision in my head of this world in quite the way after I had worked on The Art of Equestria. By then, I had seen the show, watched all the episodes, had done all this research, interviewed Lauren Faust and the people at DHX so I really feel like I understood the visual. I had access to all of this information and it made me want to get deeper inside it for this next book. The story itself is a story that speaks to something I really care about. So there was a kind of realism in my mind about why this story is important that made me want to make things even more lit and rendered and lush. The palettes really intensified and the forms made them as dimensional as I could make something that’s still a cartoony-looking character. I wanted it to be dimensional and as real as possible. TIQ: And we ended up with ponies playing chickens. Ponies Playing Chicken and not a Scootaloo to be found. TIQ: One of the fun parts of writing is creating new characters and for The Dragons on Dazzle Island you created two new ones in the forms of Blue Topaz and Ruby Redheart. TIQ: What were some of the thought that went into creating those two? MJB: When I came up with the idea for dragons on an island, I saw ponies on the island as well. I wanted the ponies there to look distinctly like they came from an island and look a little different from the ponies in Equestria. I thought, “well, what would that be?” So I started to look at tropical birds and tropical plants and noticed there were a lot of spiky shapes in island flora and fauna. That influenced my thinking. In the first sketch I did of Ruby Redheart, she had a really spiky mane and really elongated legs. It was clear that she looked like a pony, but I elongated her legs a little too much! *laughs* So I had to make the legs more pony like. But I really wanted the manes, the cutie marks, and markings—these ponies have markings on their faces—to signify that they're related but they're also from a different place. They have different cultural sensibilities than the ponies from Equestria. Which is just like we have in the world. I based my designs on the Ta Moko designs of the Maori people in New Zealand. The indigenous people of this region have traditional mark making on their bodies and particularly on their faces. These ponies had to have some kind of marking on the face that told others they’re from the island. The manes and the tails were a big departure from the show. And I totally based those on the birds of paradise, tropical flowers, and spiky palm trees. I've seen fans talking about it like, "Wow, it's so not a smooth mane, it's a spiky mane." They seem to like it! TIQ: The audience latched onto DJ Pon-3 with her amazing mane style from the first season. So apparently there's something to spiky manes. MJB: It's Kind of punk, too. I was thinking about different punk hairstyles when I did some of the ponies in the big scene where they're hugging the eggs. I didn't want them all to be the same. The character of Ruby Redheart is based on Jane Goodall. That's why she has the ponytail and the binoculars. That's why her mane is a little softer and the pony is clearly a pony tail based on Jane. I've always loved Jane Goodall. I've been a fan since I was a child. As a result, Ruby watches very closely to what's happening with these dragons while the other ponies aren't paying attention. They don't even realize that there are eggs or that the dragons are protecting the eggs, but she paid attention. She notices and she cares. That's why she's the one who alerts Fluttershy and Spike to the situation. For Blue Topaz, I thought of him as being a character who would be sort of the opposite of Fluttershy. So there would be a visual contrast. He would want to protect the gem harvest. He doesn't really care about the dragons. But he's the one who has to transform and understand that this is important to pay attention. He doesn't notice the dragon babies at first. None of the island ponies noticed, except Ruby Redheart. I wanted him to contrast Ruby and Fluttery in color. So I thought something about the color blue. The color blue related to the swirling snow, the cold, and the strife. He was reflecting that in his own color. He's also blue to suggest that he's not on the side of the dragons. To my mind contrast visually relates to conflict. Yeah. A lot of thinking that goes on here. You'd be surprised. TIQ: Oh, I kind of have a vague inkling of that since I'm currently trying to break into writing comics. MJB: Building a story, a visual story and writing the story. Have you read Scott McCloud's Understanding Comics and Making Comics? MJB: Making Comics is the second one, I think. I teach at RISD (Rhode Island School of Design) so Understanding Comics is required reading. TIQ: His third book was Making Comics. The first one was Understanding Comics. His second book—which is usually overlooked—is Reinventing Comics. The writing is a critical part. For me, the writing comes before the picture making. And I have pictures in my head but I've got to get that story down. It has to ring true to you. It can't seem invented. TIQ: Just like in Under the Sparkling Sea, The Dragons on Dazzle Island has created a brand new location in the My Little Pony world that our heroes explore over the course of the story. TIQ: What were some of the challenges in creating Dazzle Island? MJB: Initially I just thought if the dragons are going to the island there will need to be gems there. The idea of gems and dragons has come up many times throughout the storyline of Friendship is Magic and obviously through Spike. My initial thought was that the ponies would harvest them from where gems would normally come from, but then I remembered that this is fantasy. So, why not make the gems come from plants? I had a vast vision in my head where I designed the whole island, but you only see parts of it in the book. It's a picture book so there are basically sixteen spreads for me to work with. I could only show so much of the island, but my vision was to show that there are these growing plants and these gems come from them. There’s probably all different kinds of things like that which grow on this island. Not your usual fruits and berries, but other kinds of things like gems. I imagined them dripping from the trees. 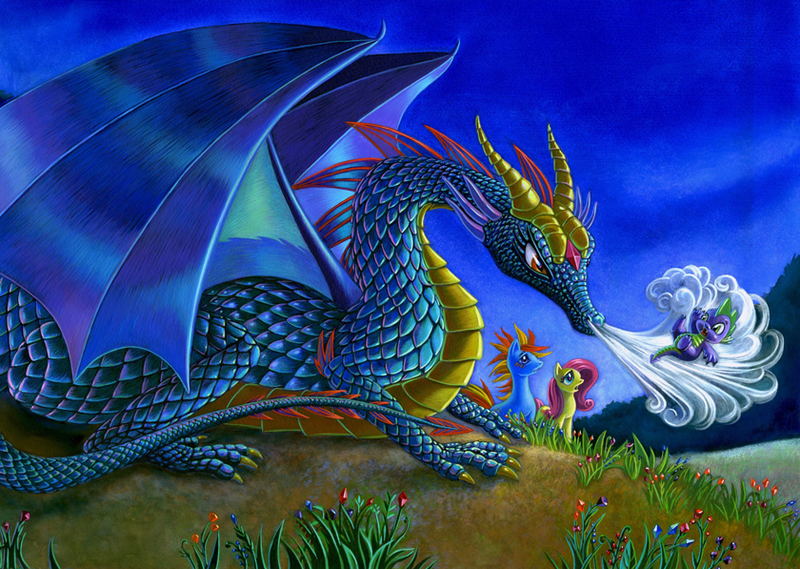 We just see a snippet of that where the dragons and the ponies are in the illustrations. There wasn't a dramatic challenge in designing the island because the pictures have characters in them. But in my head, there are so many more amazing spaces on that island that I could articulate. If Hasbro decided to revisit that part of the world, I got it! There is just so much you can do in the space I was allotted, but that one key thing of having plants that grow gems made it fantasy-like but also organic and alive! Having the ponies go to a cave and start chipping away to find gems just didn't seem like a good spot for them. TIQ: "Yes, mining, mining, mining!" When it's much better to be, "I'm now going to pick these gems here like berries." MJB: Exactly. Or pears. A big huge gem that's pear like. I had these visions of Spike going up and sneaking a nibble off of some of the trees. Obviously, I couldn't do that. It would have distracted from the storyline but I have some ideas about that. I had to look at flowers with buds and gems and I just merged the two. Which is what I did with Under the Sparkling Sea. I merged animals from land with sea creatures to make like the mantle hawk and the crabin. It's fun. That's where fantasy comes from, emerging two things that don't normally exist together ... You juxtapose them and all of a sudden it's this new idea. So much fun. TIQ: I'm sure that's where dragons originally came from, who knows how long ago? Huh, I guess Blue Topaz really is Fluttershy's opposite. TIQ: There was one particular page that caught my attention. It had Spike front and center but in the background we got a glimpse of the village that the ponies of Dazzle Island live in. What are some of your thoughts that went into creating a location that kind of rang familiar to Ponyville and yet was still so very, very different? MJB: When I designed I could imagine this whole village. But I could only think of it as a backdrop, because the most important part of that piece was not the village. It was Spike, and he had to be large and in front to show how he was emotionally really distraught over the circumstances he was in. When I designed that space, I had already looked at page after page and jpeg after jpeg of the original drawings for the backgrounds of Ponyville, things like the Crystal Palace, and all the different lands and regions because I'd done The Art of Equestria. So I knew the style and the sensibility, and I looked to see if there was anything that was tropical. There really hadn't been but I wanted that world to look and feel like was interpreted by a pony designer. I went on Pinterest and pulled up tropical huts and houses and I'd see things where ladders and other things were going up into trees. I wanted the village to be fantasy, not just this fantasy location where there's a house. I looked at a lot of visuals online of those kinds of things and then I tacked those pictures all over my big, big bulletin board, which I use as an inspiration board. I had all these pictures that I had from The Art of Equestria up there showing the different original drawing of the regions in Equestria. And, again, it was like that merging idea to pull from these pictures on Pinterest of tropical places these houses and huts, and many vacation places into the world of Equestria. There were a few that had these pointy shaped tops and ladders going up. I just tweaked it and turned it into what I thought would look cool, beautiful, and fun! If I wanted to go inside I wanted it to be appealing too. To get the viewer to say, "Oh, what is that back there?" That was the sensibility and the sources for creating that background. But like I said, I can picture what's beyond the edges for that page. And I would love to be able to draw that too. TIQ: It was revealed in one video that was released by Hasbro's My Little Pony youtube channel that you paint all of your pages by hand. TIQ: In the age of digital media a professional published work created via traditional means is becoming increasingly rare. What are your thoughts on working in a traditional medium versus a digital one? MJB: That's a really good question. I just bought an iPad Pro, so I'm going to push myself to play with layering and doing what I do in a digital realm. I start all of these pieces as a process. I'm making them from a little tiny thumbnail sketch all the way to the stage of the painting to the finish. I have thirty-two little videos that I made and a ton of pictures that I took to show where I start and what the steps are to the final picture. I'll be sharing it on my Youtube Channel—Mary Jane Begin—for anyone who's interested in the process of making a book. From Thumbnail to Final: The Process of MJ Begin. Honestly, I have too much fun painting the pictures. I have collectors who buy the original artwork. It's actually come around and interestingly from when digital first started. It's almost become kind of a "Whoo" thing now like, "Wow. You work traditionally?" I just stuck with it because I just love the physical materials. It makes me feel connected to the work when my hands are covered in pastel and water color. It's visceral. It's physically real to me and I just enjoy that. I think it's pleasure. That's the reason why I love to paint. I love to use materials! When I try to play with digital, there's a wall of glass in between me and my work and I have to learn to get past that if I want to work digitally. But I'm not opposed to learning to use digital materials and mimic some of the things that I do in there and learn some new ways of creating art. I teach at RISD so I'm teaching students who work traditionally, digitally, and cross-pollinating between the two—which I think is the coolest thing. When people work both traditionally and digitally and you go back and forth between the two media it becomes just another medium. It's a really exciting space to be in. As an artist you have this huge range of ways that you can work and you can play between them. I think that it helps to inform artists when they start with traditional materials and then segue into digital or do them side by side because there is something about the connection of surface or the brush to the surface. It's different when you're working digitally. We're human beings. We're physical in this world so I think one cannot deny there's going to be some kind of brain connection to the physical surface. A lot of my students sketch traditionally and then scan it into the computer where they manipulate a lot of their color digitally. I have a student, she drew a piece freehand in pencil, scanned it into her computer, she then manipulated with color, printed it out, painted on it, manipulated it, and threw it back into photoshop. There was this great merging of digital and traditional and I love that. I think there should be no barriers to what you can or should use. It's like the wild, wild west. That's the way that it should be as a creative person. You should be able to think about it that way and not feel like, "I have to do it this way,” or “it has to be done that way,” or “this can't mix with that." I don't believe that at all. TIQ: You and Andy Price would get along swimmingly. MJB: We should meet sometime. TIQ: Hey, maybe you'll both end up invited to the same My Little Pony convention. Who knows? TIQ: About how long does it take you to create each page? MJB: Let's see. I have to break it down. I started the paintings ... It took me, let's see, about three weeks to do the storyboards. About four weeks to do all of the sketches. 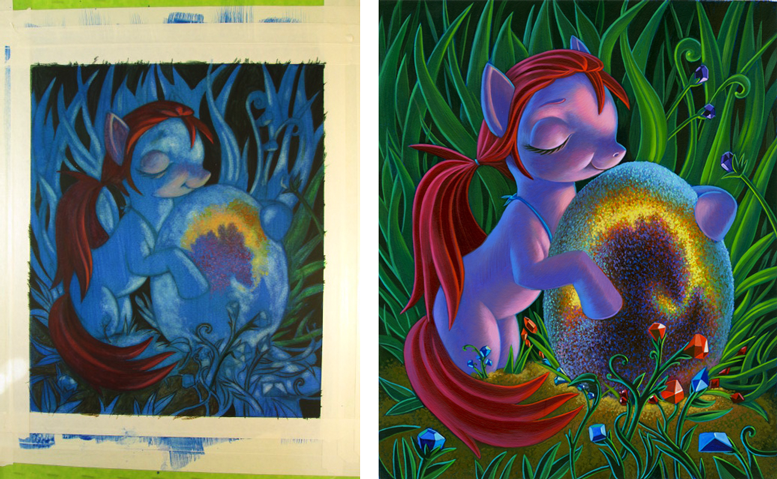 And then from start to finish for the paintings, I started the end of June and finished in mid-December. The paintings are about a week a piece—depending on how complex it is—once all the drawing is done and I transfer them onto my pastel or watercolor surface. And that's while teaching a class at RISD and while I do the Lynda.com videos. So I was writing a course on character design for Lyndia.com at night. By day I was painting and teaching a class at RISD. There's also time in there for Hasbro to do approvals. They had to approve the storyboard. Little Brown had to approve the storyboard. Then the sketches had to go through the same review process. They're complex paintings so they gave me the go ahead in June and then I just hit the ground running and painted every single day. Took a week vacation but other than that, painted on it every day. TIQ: Even with your nose to the grindstone you need to have time for yourself. MJB: That was the thing. I took my evenings partially off and I would spend maybe an hour or maybe two writing the Lynda.com stuff. My sweetheart and I needed time just to relax by the fireplace, have a glass of wine and be right there with him. I managed to work that in because if you just work continuously you’ll burn yourself out. At this point in my career I know to take your breaks and take your quiet time. I finished the book right before Christmas because I needed to have the holiday to be able to celebrate with my family. I set a time. Went down to New York and hand delivered the artwork to Little Brown. It was quick and then I was off to lunch where we celebrated! They were thrilled with the artwork. They're terrific people. On both sides—at Hasbro and Little Brown—I get to work with amazing, smart, funny, cool people. And they're very supportive. They're just great! They make me feel so good. TIQ: It's great when you have co-workers like that. MJB: Yeah… It's funny because people wonder how much creative freedom I have since this is an IP that they assume it's so defined. But I get to be creative. You'd be surprised at how much both Hasbro and Little Brown support my creative approach in terms of story telling and making the pictures. I won't say give me carte blanche—because there are things we have to relate to the story—but they give me a lot of freedom. It's up to me to bring my style and vision to the table and they let me do that. Hasbro, I give them credit. They didn't have to go this route. They've already defined the pony style in terms of licenses and all that, but they're a creative company. There's a lot of creative thinking about how to explore different avenues of their different IPs, including Pony. I like that. TIQ: There's also a lot of creative ways to deal with all of the original art that you've created for both this book and the previous book. Aside from selling the pages to art dealers, do you have any ideas for possibly doing charitable auctions, raffles, or some other ways to get the art out there to the general public? MJB: I would love to do that! I did have a show at the National Museum of American Illustration in Newport (Rhode Island) for Under the Sparkling Sea back in 2013. They have paintings and drawings by NC Wyeth, Norman Rockwell, and many of the golden age of illustrators. You have to come to this museum if you're interested in illustration, because they have all of these luminaries covering the walls of the museum. 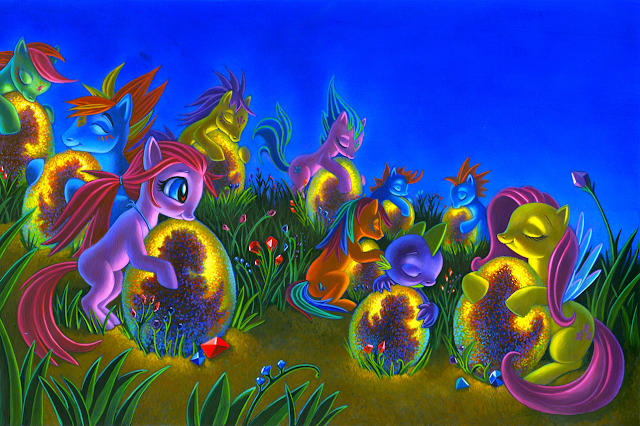 My work on My Little Pony, was exhibited and is still on view there. It was so exciting and it will happen again in August of 2017 for The Dragons on Dazzle Island. I like the idea of being able to make a print special for an auction for a charity. I'd be into that so if there are people who were interested in connecting with me on that, I would totally be open to it. Otherwise, the artwork just sits in the drawer for the year. MJB: I love having the book out, but the original art is where it started. I would be happy to see it come out of the drawers and make an appearance in places where people would appreciate it. It would be cool. TIQ: Awesome. Let me know the exact dates for the art show for The Dragons on Dazzle Island and I'll make a point here to actually be there since I'm probably only a couple of hours drive away. MJB: Oh, that would be great! Doing what you're doing in comics, I think you'd be really impressed. They also have Charles Dana Gibson who did the Gibson Girl pen and inks and these very funny, comical drawings of people from the early part of the 20th century. I would love it if you would come to the show and I will definitely give you a heads up on the dates. We haven't settled them quite yet. TIQ: I'll look forward to it! TIQ: You've brought up The Art of Equestria a couple of times so far in the interview so how did you end up getting the assignment to write the first art book for My Little Pony? MJB: I had finished the other book, Under the Sparkling Sea, and that had been out for a year, but not quite two. I was starting on Dazzle Island then and I had to put that aside to start on The Art of Equestria. Hasbro paused me for a year because they were working on season 5, so I had to wait to get started on Dazzle Island. The title wasn't even that at the time I finished writing the story. I wanted to get into the sketches of Dazzle Island in the fall of 2014… I'm trying to think when The Art of Equestria came out. Was it 2015? TIQ: Yes. It premiered at last year's New York Comic Con. MJB: The Art of Equestria is an Abrams book and I was given the assignment by the people at Hasbro who worked with me on the picture books. They said that, "We feel that you have immersed yourself in Pony and you are both a visual person and a writer. We think that you will handle this really well. By the way, the deadline is in eight weeks." TIQ: Eight weeks to put together that book!? There were graphic designers at Abrams who put the pages together and did the basic fundamental design after I did my part. What I was charged with was writing all the copy, getting all the tag lines, interviewing DHX, interviewing Lauren Faust, interviewing Hasbro studios, editing and distilling all that—I couldn't use all of it—and then collecting all the visuals based on different episodes for each chapter plus deciding what the chapter headers would be. I worked on that with the people at Hasbro. We changed things around in the Table of Contents, but then I had to gather all the visuals, do the interviews, and write this copy. Now that was pedal to metal. I worked day and night on that because I had to. The deadline was so tight and I had to go to Hasbro and look at all of their flash files. And you can't print from flash files! *laughs* I had to convert each image into a jpeg or a png. So I had to look and chose which pictures and which episodes I wanted to showcase based on what I was writing, interpreting, and gaining from the interviews. I had to put that all together and get that all packaged for Hasbro to review and then for Abrams to say okay on. I looked through, oh, my God, 2000 images. Maybe 3? I was trying to decide what to eliminate because I couldn't show it all. That was when I decided to watching every single episode that I could get my hands on from season 1 to season 4. Season 5 was in production so I got some visuals and the scripts. I said to myself “I have to know this thing inside and out. This is for the fans and it has to be as good as I possibly can make it.” They're the ones who are going to fall in love with it if I do it right. The pressure was on, so I immersed myself deeply through the whole process. TIQ: You managed to sort through concept art, storyboards, production art, production notes, conducted a bunch of interviews, and you also created an entire section based on a certain fandom of grown-ups who fell in love with the show. MJB: Yes! That was really important because Hasbro acknowledges there's a fandom and there are people who create art based on their properties and that they have supported it. They just hadn't celebrated it. They hadn't done anything in a book so I felt it had to be in there. There was so much fan art one could show. So much cool, good stuff. They decided to show the Mighty Fine art, which is a small segment of all of the stuff that's out there. I mean the book is only 78 pages or 108 pages. It's not a super long book so we had to, obviously, pick and choose. I was ready to go bat if nobody was talking about doing it but Hasbro supported me. They're like, "No, no. That should be a chapter. It needs to be in there." TIQ: With the show still continuing on from season 5, now into season 6 with hopefully a season 7 coming soon. Fingers crossed. TIQ: If the show goes for another few more seasons, do you think we'll possibly get a volume two for The Art of Equestria to cover the stuff that has come out since the last book came out? Or possibly a book dedicated to the movie since apparently movies like having art books now? MJB: The movie is more likely to be used as a book base. I don't know. This is not a conversation I've had with Hasbro so this is pure conjecture. Do not hold me to this. I think it's highly likely that they would do something related to the movie simply because there's going to be a lot of art and visual development going into that. It's also possible that if The Art of Equestria has been hugely popular they may go back, as there's so much art that has been created since the last book. But it couldn't just be a repeat of that book. Knowing Hasbro they would consider, "What's a different take? How do we want to come at this subject from a slightly different angle so it makes an interesting second book, and not a repeat of the first book?" I don't know if they have things in the works. I think there's a couple of things being talked about and I'm not at liberty to say what those things are, but the simple answer is yes, I believe there are conversations going on for future art books. But I cannot confirm nor deny. TIQ: I don’t know, but my gut says maybe. 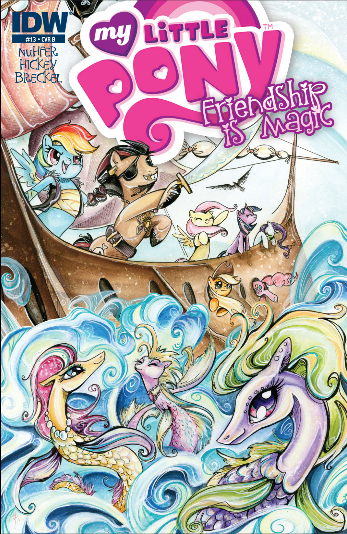 TIQ: My Little Pony: Under the Sparkling Sea was the first book that you created for the My Little Pony line and it's left a lasting impact on the franchise. How does it feel knowing that the designs you came up for the sea ponies are being used in all My Little Pony licensed media to date? MJB: It's interesting because as an illustrator part of you is like, "Well, wait a minute. No, that was a design I made and I should be reaping the benefits from that." But, on the other hand, I agreed to do something that I knew when I was creating these characters it would become a part of the canon and the lore of My Little Pony. So I understood that whatever I made Hasbro can do what they want with it. The fact that I'll come up with something that so many people then can appreciate and enjoy is really exciting! I haven't even tapped into it. I'm sure I don't even know about half the ways that the work has been influential in the pony world. I saw the comic featured my sea ponies and mermares, and I asked for a copy! TIQ: Well the sirens from the second My Little Pony: Equestria Girls movie were definitely influenced by the seaponies in Under the Sparking Sea if their designs are anything to go by. TIQ: The second Equestria Girls movie. MJB: Now I haven't seen that. MJB: No. I don't pay attention as much to Equestria Girls so I had no idea! *laughs* I should see that. The second Equestria Girls movie. What's the title of it? MJB: Rainbow Rocks. All right. I'll have to check that out. These designs look inspired by something. I knew exactly what I was signing up for and I'm treated very well by Hasbro so I have no complaints. If somebody took my work without my permission and used it to make money, that's different. But Hasbro, we have a really good relationship and I'm psyched that my stuff is being used it more ways than I even knew. It's cool! TIQ: What were some of the creative challenges in building the undersea world of Aquestria? MJB: When I thought about Equestria—there were no visual reference other than something in the original style guide, and there were some pictures of the background, but I didn't see anything moving, just a few images. I knew that it should relate to that fantastical sensibility but my first thought was if it’s under the sea what are the coolest things in the ocean? Shells. I love shells. And I have them all over my house. I have baskets of shells everywhere so I thought, "I get to draw shells!". People ask me about the palette of that world and it's really due to the shell. When you look at a shell and see a rainbow reflection, that was the color palette I wanted this world to reflect. When I illustrated this book I would play really loud music by this German composer, Ulrich Schnauss. It's surreal and ethereal. It's this really peaceful music and that allowed me to go into a space and paint intuitively when I painted my paintings. I paint with strings of color. If you saw my process, it's like threads of color to build this palette that you see. It’s like Equestria even though it's under the sea and, of course, it relates to Atlantis. I like the idea of Atlantis. It was meant to reflect what Equestria would be like underwater. What would an Equestria world look like? So I had to relate to that original work. Everything always does. It always has to look back. TIQ: Speaking of relating back to Equestria. The first book focused on Rainbow Dash. The Dragons on Dazzle Island focused on Fluttershy's Spike. TIQ: Is there any chance that we might be seeing more books from you that focus on the rest of the main six characters? MJB: I would love to do that because I'm fond of every single character! They all have a different sensibility of what their story would need to be about. The initial thought for the first book was to make sure that all main six were in there because the show was new. The second one we weren't so worried about that. It takes time for these things to evolve. I've already expressed interest in doing others. And it would only seem fair to have them about other members of the main six because now Spike and Fluttershy have had their moment. So, yes, I would definitely love to do that. TIQ: Yes, I can only imagine what you'd be able to do with Twilight Sparkle. MJB: Well, I already have an idea of a story that I think would be wildly cool. I may just put that out there. I'm in the middle of getting The Dragons on Dazzle Island out there but I've already written something that I think would be cool for Twilight and her personality so ... Shhh, I didn't say that. TIQ: My lips are zipped. Is there anything else you'd like to talk about? I'm really thrilled that you guys were able to do this interview and so pleased about the wonderful review that Sethisto wrote for the book! This story has so much meaning to me because it's about two different tribes that have to try to listen to each other and help each other to solve a problem. Will the dragons be born? If this cold continues they never will be. So they require the ponies’ compassion and empathetic hearts to make that happen. I feel like in the world today there's just so much negativity and it's such a difficult world for children. I hope that the people who read this to their kids understand this message and why I chose to express it. It has deep meaning for me and I hope for you, as well. TIQ: Absolutely right. Sometimes you just have to teach the world how to chill. MJB: Exactly, but actually stay warm. Chill, but stay warm. TIQ: And hopefully figure out a good way to insert a Coca-Cola ad. It's interesting. People say, "oh, you're doing something that is so commercial." And I say, "It couldn't be more passionately creative and resonant of things that are meaningful to me." The people at Hasbro care deeply about the messages they send out into the world. This isn't just about making toys. Nobody should be fooled to think that. And that's why I think the show is so awesome. It's because they have these great writers who get it. Yeah, I'm a huge fan. TIQ: Thank you for your time, MJ. It was amazing! Rarity's entire order of rare island gemstones has been canceled because the Great Dragon Migration has brought dragons to Dazzle Island! 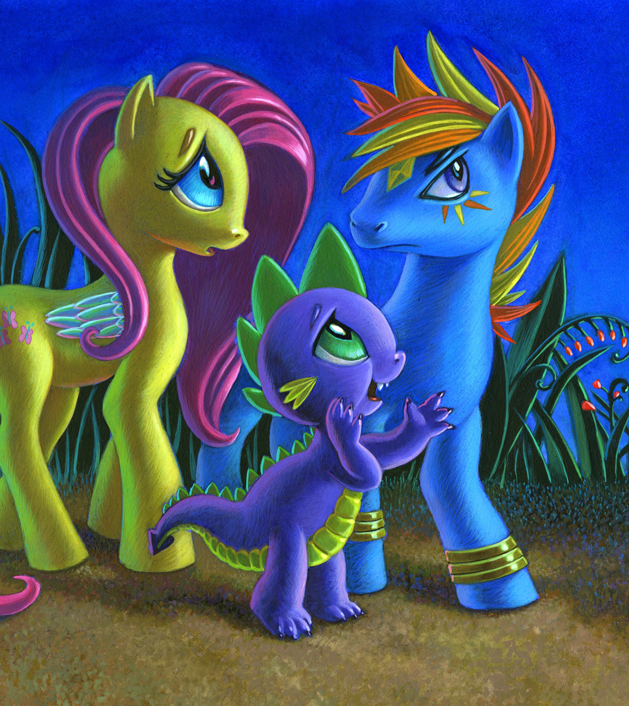 But all hope is not lost as Fluttershy and Spike travel to the island and explain to the dragons why they need to move. When our heroes reach Dazzle Island, they discover that it'll take more than a few words to resolve Rarity's problem! Ready your hooves as you travel with Fluttershy and Spike to confront new dangers, help a fellow pony gain her cutie mark, and learn the true power in hugs! To see the rest of her previously published children's books, check out her Amazon.com Page. Draw Spotlight Splash Event - The Entries!